Analytic philosophy has come to dominate organizational theory and management education, despite criticism from several notable scholars. The European continental philosophical tradition, on the other hand, is seen by some as a counterpoint to US- and UK-dominated functionalistic organizational theories. These two very different schools of thought are now largely practiced in isolation from one another. Late nineteenth and early twentieth century philosopher Ernst Cassirer served as a mediating force and facilitated a fruitful dialogue between the two schools until he was forced to leave Germany when the Nazi party came to power. 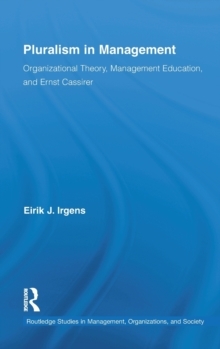 In Pluralism in Management, author Eirik J. Irgens utilizes Ernst Cassirer's pluralistic philosophy in order to investigate how different but connected forms of knowing, including art, myth, religion, science, and history may help us become better organizational scholars and management educators. With a special emphasis on the complementary qualities of art and science, Irgens builds on Cassirer to discuss how art and science represent two different but complementary channels to reality, in contrast with each other but not in conflict or contradiction, and the challenge of developing "two-eyed" managers. Revitalizing Cassirer's almost forgotten philosophy, the book illustrates the value of philosophical application to organizational study, and the need for bringing together the best of the humanities and the science based management traditions in order to improve management education.